Percy Harcourt was born on 14 November 1875, at 5 Grafton Street, Dublin, Ireland, the son of Charles Lionel and Elizabeth (Woodburn) Reis. He married his first cousin Laura Swallow on 17 November 1905 at 15 Park Circus, Glasgow. He died on 5 March 1940 at St Stephens Hospital, 369 Fulham Road, London SW10. Laura Swallow was born in 1882, at Birkenhead, the daughter of Arthur and Harriet (Reis) Swallow. Laura died on 16 November 1940 at Holloway Sanatorium, Virginia Water, Surrey. NOTES: The marriage certificate of Percy and Laura can be viewed HERE (<— PDF). He has also been found on the 1901 census at 12 Claremont Terrace, Barony, Glasgow, occupation jeweler. He may have continued his father’s business. 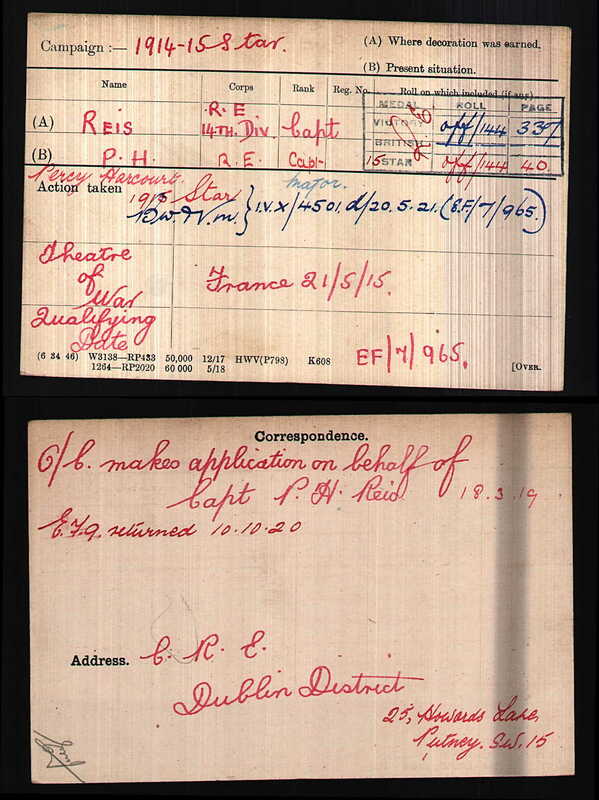 The page from the census can be viewed HERE (<— PDF). The probate address for Laura is 7 Clive Court, Maida Vale, London. 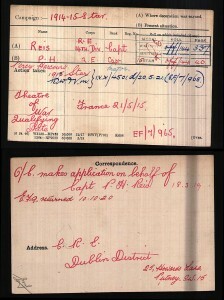 Some material from the PRO relating to Percy’s service in the army during World War One has been received and will be summarized here eventually. His marriage to Laura was, according to the forms, of the “Jewish church”.